This unusual metal double framed doors are a single framed panel with a pane of frosted glass running the entire length of the door. The metal has been painted with black enamel. In order to protect the door and the glass, a grille has been added to each door's lower half. An arch has also been incorporated into the design of the grille to tie together the design elements seen in the fan light and the archway. 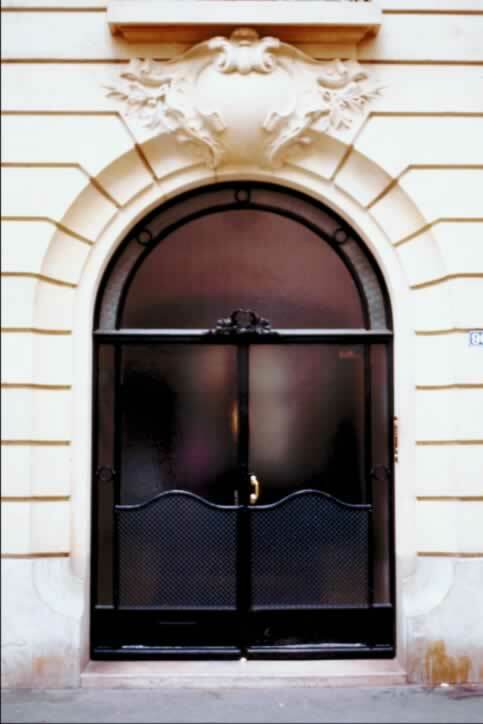 The fanlight is made of the same materials as the door, although a grille has not been added. Three metal circles add interest to the fanlight in the 11:00, 12:00, and 1:00 positions. A metal sculpture of two horses meeting nose to nose has been mounted on the transom. Only one door has a polished brass handle, which looks slightly out of place mounted on the frosted glass.